travel | You Can Shake the Gates! travel – You Can Shake the Gates! The kids had been asleep for a few hours at the other end of our twenty-foot long house. Angela and I were drifting off to sleep, talking quietly, listening to the night sounds of the jungle surrounding our little house. Our dog’s intense barking broke the peace of the moment and signaled to us that something was up. “Brother Todd,” a voice called. Our neighbor was braving our 110 pound Rottweiler-German shepherd to get close enough to get our attention. “It must be serious,” I thought to myself. The Nissan Patrol that played a part in this particular adventure. We jumped into action. 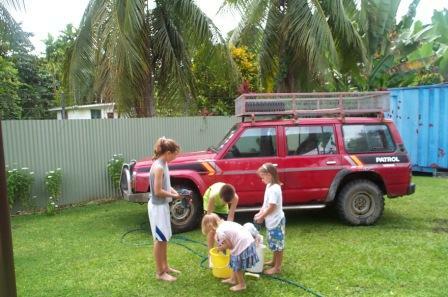 I ran to the house, gathered myself and my things and began loading what I would need in our Nissan Patrol 4 x 4. Angela attended to her friend. Her friend’s relatives got themselves together. I backed the vehicle down close to their “camp”. Angela’s ailing friend, nine guys with knives, and me piled in and headed into the dark, forbidding jungle. Through the bog, onto the main track, through the creek, over the mountain. Sloppy, sloggy, digging new ruts. We were really tearing it up. By grace we made it out to the main road and were headed to the hospital in Madang. 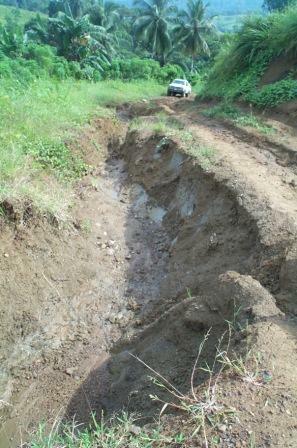 Even on the main road, we needed to use power to both axles as the main road is gravel, filled with ruts, potholes, sinkholes, landslides, even stretches where the road is simply what I would call a clay bog, if you can imagine. We made it into the hospital just in time. Our friend was hemorrhaging and needed emergency surgery to stop the bleeding. The baby wouldn’t come for another month! This is perhaps more dramatic than many uses of our 4 x 4, but represents the importance of having the right gear to be the hands and feet of Jesus in a place where there are few resources (like decent roads, hospitals close by, or even electricity in rural areas). The 4 x 4 in Bible translation ministry, as we do it in Papua New Guinea, is a vital tool to help the helpless, get us to and from the village, and support the translation and literacy program in myriad ways. We are looking at options currently–what kind of 4 x 4 will meet the needs of the ministry that God has placed in our hands. We are on Day 5 of a campaign meant to add 40 new monthly financial partners, 40 new special-needs financial partners, and 40 intercessory prayer partners to the team. Would you join us? If you’d like to partner with us financially (either monthly or on a special-needs basis) click here to visit the Donate page. If you’d like to partner with us as an intercessor, click here to drop us a note sharing with us your intention to do so. 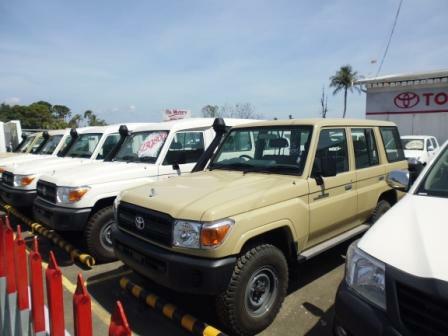 The model of Toyota Landcruiser being sold in PNG currently. Thank you, friends, and blessings to you! September 17 (Day 38) — Tuesday. Heading into Madang, God willing, today to rest and prepare for the journey home. Much has been accomplished. Pray today that Todd will have good conversations with the missionaries he has yet to get acquainted with, with old friends, and with co-workers. Pray that Todd will have strength, clarity, and ability to wrap up responsibilities in Madang before leaving on Saturday. Pray for God’s grace and mercy to rest on each word, each conversation, each encounter, that Todd will be a blessing and encouragement to all that he encounters. Pray for the Aruamu today, that the experiences of the crusade—the workshops, celebration, worship, and preaching will leave a lasting imprint on the heart of each attendee. Pray for a powerful move of the Spirit in each life. August 27 (Day 17) — Tuesday. Continue to pray for Todd’s trans-Pacific journey today. Pray today that one of the Somau Garia friends who has been praying for and anticipating the Owen family’s return will get the word and be able to get into town to meet with Todd and make arrangements for the trip out to Uria Village. This trip involves buying food and other supplies, riding in the back of a flat bed truck for 40 miles, from the main road into the village for a couple of miles, finding a place to sleep for the week (if the house is greatly damaged—a genuine possibility), and setting up housekeeping for the week. Pray for God’s mercy in making these connections and basically getting it done. August 26 (Day 16) — Monday. August is drawing to a close. Todd is boarding his flight to Papua New Guinea today. Ahead is the unknown. Six years away from Papua New Guinea is a long time. Todd and Angela’s emotions will be swirling today, a mixture of anticipation and butterflies fluttering around in the stomach. Pray for the travel to the airport, for Todd’s luggage, safe passage, and timely connections. Pray that as Todd progresses toward Papua New Guinea, he will be filled with the confidence that comes through the Holy Spirit. Pray with him that even as he flies, God will be preparing the way and moving his angels and people to create divine appointments. Pray for God’s anointing on this time.